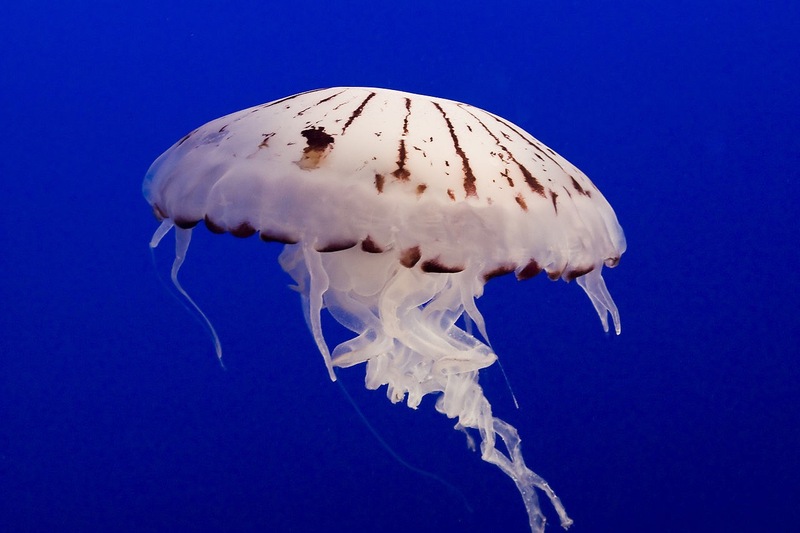 so yeah, first things first – jellyfish aren’t fish, they’re actually classed as plankton 戀. this is on account of them having none of the aforementioned important items (brain/heart/bones) and the fact that they have very limited swimming ability. much like hot air balloons (i could have sworn that there used to be a hot air balloon emoji … this isn’t going well), jellyfish travels are mainly based upon the currents . right, now that we have that out of the way … it’s time to move on to the rather mental question of how a creature that is 95% water and has neither of the two most important organs (for humans, anyway) even exists in the first place!? well, when you consider the heart question, you need to think about why we have a heart and why it’s so important. we, of course, use the heart to pump oxygen around the body … because we have thick skin and muscles and stuff. jellyfish, however, have an outer layer – named the ‘ectoderm’ – that is super thin … like a few cells thick … so oxygen just diffuses it’s way directly through  #efficiency. now, the awkward lack of brain thing – it certainly makes thinking difficult . due to the lack of brain, jellyfish use a host of basic sensory nerves, that sit at the bottom of their tentacles, to sense light, temperature, smells, etc. i actually find them fascinating, even more so now that i’ve learned more and written this. i think i’ll look in to jellyfish even more – it’s just mental that something so simple could be a legit thing that is alive! ?